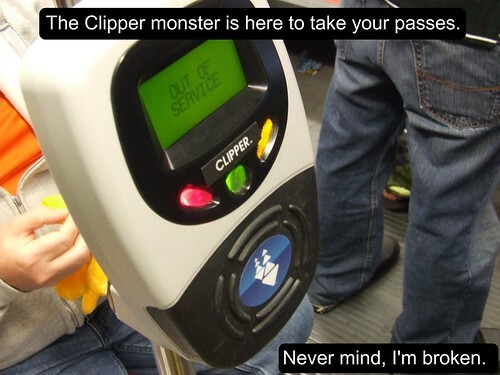 There's been some new changes with the Clipper card that just started a couple of days ago on July 1st. I'm skipping on all the fare and pass hikes, and going on the changes in rules governing Clipper. The rail agency raised fares 25 cents per zone, but if you are a one-way fare passenger, you can be immune to the fare hike by simply using the Clipper card to pay for your rides. If you use it for two rides, you'll save, but if you need a day pass to take three or more rides, you are better off by paying the paper ticket fare as the day pass program is unavailable through Clipper. For those using 8-ride tickets on Clipper, the expiration has now been reduced to 30 days. Lastly, passengers can now purchase monthly passes up until the 15th of the month; it used to be the 9th. For example, for the July pass, you can buy up until July 15th. Once it's July 16th, the August pass is available. The agency has gone full blown Clipper by eliminating all paper monthly passes and going electronic only. For those who have a local monthly pass and wants to ride an express bus, the passenger must have enough e-cash on their card to pay the difference. Bus drivers cannot accept a cash payment substitute to compensate for the upgrade. Day passes can now be earned using Clipper. When a passenger uses their Clipper card to pay the e-cash fares, once it hits a threshold, the rest of the rides on the agency is free. One bad problem: If you earn a day pass for local routes, but want to take an express, you don't pay the upgrade fee from your Clipper e-cash purse, you pay the FULL price of the express fare. My tip: Continue to buy paper local day passes from the driver if you plan to take an express bus later on. Formerly known as WETA, the agency recently permitted Clipper card use for the brand new South San Francisco Ferry route. Passengers will need to tag-on and tag-off on this route because the agency is going to expand Clipper to other routes based out of Oakland and Alameda, and by tagging-off, the fare will be properly calculated. If you rode Caltrain between April 10th to the 16th and used Clipper card readers at San Francisco's 4th & King, or the San Mateo stations, you may be obligated to receive a refund. The card readers overcharged passengers using the system. Clipper should have issued refunds starting June 22nd, and the refunds are done by tagging your card. Check your online records via the Clipper website for more information. For more information about the refunds being issued, click here. I had naively believed that Clipper was optimized to give you the best fair in all situations. Do you know if I write them showing the $2 overcharge (as compared to paying cash for paper passes) that they might reimburse me. This is the problem I have been experiencing. "One bad problem: If you earn a day pass for local routes, but want to take an express, you don't pay the upgrade fee from your Clipper e-cash purse, you pay the FULL price of the express fare." Here is a summary of my route: BART to freemont (paid for out of my clipper hi value bart purse). Then I board the 181 express to San Jose (and pay $2, properly calculated as a transfer from BART to the express bus). Then I board the light rail for $2. On my way home, I board the light rail ($2) and finally the 181 bus back to BART. The problem, as you point out, is that it charges me $4 for the final bus, making it a total charge of $10 spent on VTA travel. Of course, if I buy a day pass at the beginning with my BART to bus transfer ($6) it covers both light rail trips. And then my final express bus home would be a $2 upgrade. Total fare: $8. It took me a few weeks to notice that my last express bus back to freemont cost me $4, instead of the $2 I was assuming. Again - in your knowledge of Clipper, do you think I can make a case for a refund?? I feel like a dummy. Please disregard this message. I looked at my ride history. Clipper is NOT charging me for the 2nd light rail trip. So my daily charge is $8. Which is the SAME as cash.